Adult clothes moths do not cause damage – it is the larvae, which actually feed on wool, they produce that cause the problem. There are only two kinds of moths to be concerned with: the webbing moth and the casemaking moth. Adult clothes moths do not cause damage – it is the larvae, which actually feed on wool, they produce that cause the problem. There are only two kinds of moths to be concerned with: the webbing moth and the casemaking moth. Both moths’ larvae spin a silken tube that acts as a protective barrier. The webbing moth larvae attach their tubes to dark crevices or seams, making them stationary to feed in one location. The casemaking moth’s larvae do not attach their tubes, or “cases,” allowing them to remain mobile and cause a larger amount of damage. The lifecycle of the clothes moth can range from two months to 2 1/2 years. The adults lay eggs on products that the larvae will consume. Each female moth can lay 100 to 150 eggs that hatch in about five days. The larval stage itself can last from two to 30 months. The lifespan of the moth depends on the availability of food (like wool). That is why moths can be so devastating to rugs. Rugs provide a huge source of food; if gone unnoticed the larvae can feed for almost 2 1/2 years. An infestation of only several weeks can result in pile loss the size of a fist. 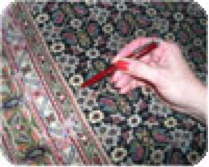 Moths and their larvae thrive in the dark, undisturbed areas of a rug that get little traffic and are seldom vacuumed. Moths are attracted to the keratin in animal hair; a dirty rug covered in dog and cat hair is a paradise for moth larvae. They can feed on blends of natural and synthetic fibers, but not on materials made only of synthetic fibers. They also tend not to consume cotton. Indicators to look for are a lot of flying adult moths – this shows the infestation may be considerable. Look for loose carpet fibers on top of the rug pile – this is a result of the larvae actually eating the knots off the rug foundation. Also, look for the cocoons (slightly fuzzy cylinders 1/8-inch in diameter and 1/2-inch long that are the same color as the rug pile). You may see the actual larvae squirming along the pile surface and underneath the rug. So how do you get rid of a moth infestation? Start with a thorough, professional in-plant cleaning. The washing removes the larvae and a hot dry room can destroy the eggs. 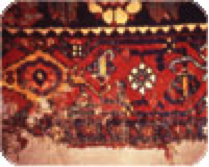 However, an infested rug will bring larvae into close contact with other rugs, which can spread the problem. The larvae must be killed to prevent migrating from one rug to another. The safest and most effective insecticide a rug cleaner can use is pyrethrum. The product is the oleoresin extract of dried chrysanthemum flowers referred to as pyrethrins. These strongly lipophilic esters rapidly penetrate many insects and paralyze their nervous systems. These materials are contained in various commercial products, commonly dissolved in petroleum distillates. Some are packaged in pressurized bug-bomb containers. Use a pyrethrum product specifically formulated to kill clothes moths, particularly those in the egg and larval stages. This treatment should be performed to protect the rugs in your care (Note: Do not advertise you are killing insects unless you are a licensed pesticide operator). As with applying any material to a rug, first test it in an inconspicuous area. Spray the infested rug thoroughly on the front and back, preferably outside or in a well-ventilated room. Roll the rug up and put it aside for a day to allow time for the pyrethrum to work. Rolling the rug will keep the concentration high and potentially more effective. The rug is now ready for a typical cleaning. A good vacuuming or a run through a beater/duster will be effective in removing the dead moth matter. The rug should then be washed using a typical in-plant method. If the only cleaning method available is hot-water extraction, be certain to thoroughly clean both sides of the rugs. Be aware that mothballs, flakes and crystals (naphthalene or paradichloro-benzene) are ineffective in moth control for rugs. These materials act only as a minor repellent to moths; they do not kill moth larvae, and the naphthalene odor can be unpleasant and difficult to remove from the rug. Mothballs are essentially bad. The active ingredients enter the human system through inhalation, and may cause irritation to the nose, throat and lungs. Headaches, confusion, excitement or depression and liver and kidney damage may result from exposure to mothball vapors over a long period of time. The safest way to protect rugs from infestation is with moth-repelling agents containing magnesium silicofluoride, a moth repellent. It does not kill moths, larvae or the eggs. Instead, it makes the wool less appetizing by changing the taste. It is applied as a spray solution and should thoroughly cover the front and back of the rug. It lasts for up to one year (or until the rug is washed again), has no residual odor and is not harmful to people. One of the major hurdles to preventing moth damage is consumer education. Too many consumers believe that cleaning is not good for their rugs. People are home less than they ever were before, have less time to care for their rugs (vacuuming, other regular maintenance) and have even less time to inspect dark places such as under furniture for problems. Dirty rugs are targets for moth infestation. It may be worthwhile to offer these profitable services, but again, do not make claims of killing insects unless you are a licensed pesticide applicator.